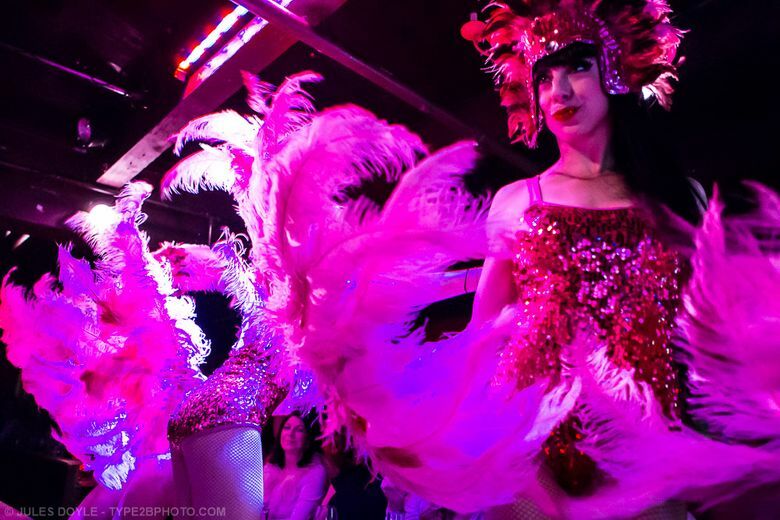 The Seattle theater’s resident company is now starring in “Flamingo,” a bright, brassy, bossa nova burlesque show. The Friday night audience of excited couples, and even more excited bachelorette parties, erupts. Betchtel, also the production manager and co-owner at the Can Can Kitchen and Cabaret, is the consummate host, a boyishly handsome entree into the fabulous burlesque circus that is “Flamingo.” The pink-painted, Bossa nova- and showtune-inspired fantasy is running at Can Can through Oct. 11. Through Oct. 11, Can Can, 94 Pike St., Seattle; $35-$65 (206-652-0832 or thecancan.com). Note: Early shows, such as “Flamingo,” are 17+; late-night shows are 21+. The “Flamingo” cast includes the barrel-chested Betchtel, the piercingly pretty Baby Kate, the elegant and poised Le Minx, the charmingly cute Elise and the flirtatious Neon Keon, who does pullups from the theater’s ceiling pipes and blows bubbles into the audience, all while wearing a rubber ducky thong. The highlight of “Flamingo,” however, is the duet between Johnny Boy and Baby Kate; it’s a restrained, though very adult, courtship, culminating in Johnny Boy, dressed in slacks and tank top, doing a push-up on the railings of the catwalk as Kate, in a white work shirt, is draped over his back. Can Can, which opened its doors in 2006 (the same year Betchtel graduated from Cornish College of the Arts and was hired as a janitor and lead server), turns 10 this year. Minx, 28, (real name: Fiona Pepe) who has worked at the theater since she was 19, says she considers the place a second home. Before it was Can Can, the small, subterranean market theater was home to the Patti Summers Jazz Club for more than 20 years. When owner Chris Snell took over, he renovated the space, adding a catwalk that splits the room. He installed elevated booths, making the house feel both intimate and cultured. The venue’s sultry shows can be an aphrodisiac for the audience members, accentuated by the refined dinner menu (the highlight of which is the tenderloin poutine) and the spirited cocktails, including a delicious Old Fashioned. And all the while, Can Can’s halls fill with hooting and whistling — especially when Betchtel asks to be (mostly) undressed by an audience member he chooses from the crowd nightly. But other times, Betchtel’s own mother may be in attendance, cheering her son on from the seats.